I have this theory about communication in the workplace. I developed this theory after working in a law department that had awful–no–virtually non-existent communication. It was the first time I had ever encountered such a phenomenom. After all, much of a lawyer’s work involves communication. We write briefs and legal memoranda, we argue motions and cases before courts and administrative hearing officers, we give presentations and do training. So you would think that communication would be inherent in any lawyer, especially one who manages an entire department. But sadly, such was not the case where I used to work. I had never worked anywhere before where there was no communication when people joined the department or left the department. Even if the person left under clouded circumstances, there was usually an e-mail that said something to the effect of “Clarence Darrow has left the company to seek new opportunities.” “Seek new opportunities” is the universal code for fired. People work in companies; they are not machines. People get married, have children, run marathons, win awards, retire, and all sorts of such things. Why not share these events with the department? I can understand concerns about privacy, but what’s the harm in announcing that a long time employee has retired? Some people don’t like to have their personal information shared, and that’s ok. Check first. But more likely than not, the staff will want to share their good news. And the recipients will want to know the good news. Why? Because they care about each other. Here are some actual examples of poor communication. I found out three months after the fact that a manager in our litigation section had retired. I knew this guy personnally, not well, but I would have sent him a card congratulating him if I had only known. I found out one of my colleagues was pregnant only when I saw her carrying her six week old baby. I would have sent her a card or given her a baby gift. I found out a new office manager was joining the staff from the folks in the department he was leaving. I used to complain to my boss that I never knew what was going on in the department. Not being a member of the “management” team, I was not invited to staff meetings with the GC. Instead, I had to rely on the “trickle down” theory of communication, which clearly did not work very well. In other words, get used to it. Yet, even with all the Welbutrin, Zoloft and Lorazapam I took, I never could get used to the lack of communication. You might say– what difference does it make? I say it makes a big difference. First, and most obviously, it is difficult to perform your job well with limited or inaccurate information. And information is transferred from one person to another through– yup, communication. I apologize for getting so basic, but clearly there are people in management who have yet to grasp this fundamental concept. Second, the lack of direct communication between the boss and the minions creates what I call the filtering effect. I liken the management team to the layer of sand that lies between the earth’s surface and the underlying water source (aquifer). This layer filters rainwater as it soaks into the earth before it reaches the aquifer. The filter removes some of the inpurities in the rainwater. This layer is essential to the groundwater cycle, but devastating when applied to human relationships. Why? Because all communications are being filtered by this management team. In practice, it means that the minions are never quite sure if they are getting complete or accurate information from the Boss– since it is filtered through the management team. As I said above, it is difficult to perform a job well with limited or inaccurate information. The reverse is true as well. Information from the minions to the Boss is also filtered by the management team. The team makes sure that the Boss only hears what the management team wants her to hear. It seems to me that the Boss, just like the minions, is getting the short end of the stick. What kind of Boss would want to operate under such a system? Plenty, it seems. 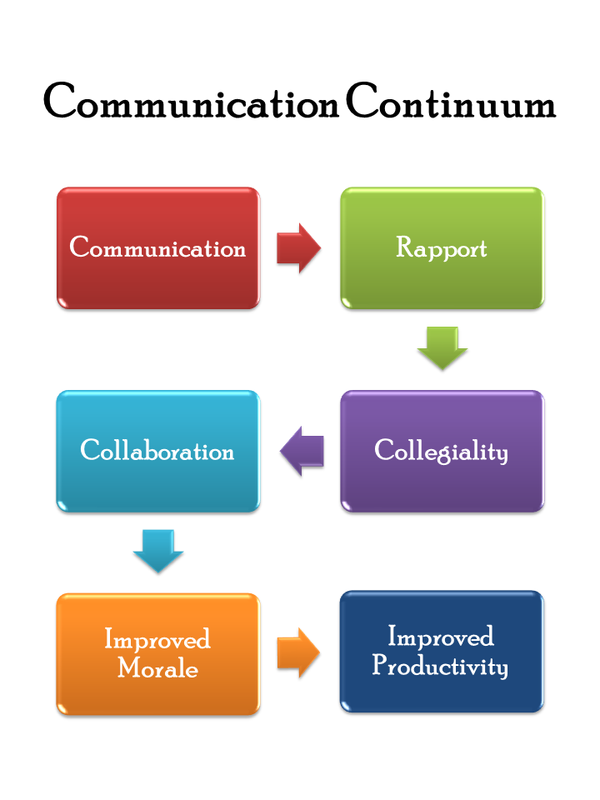 Third, poor communication inevitably leads to the lack of collegiality, cooperation and collaboration. These in turn, produce low morale, which in turn negatively impacts productivity. 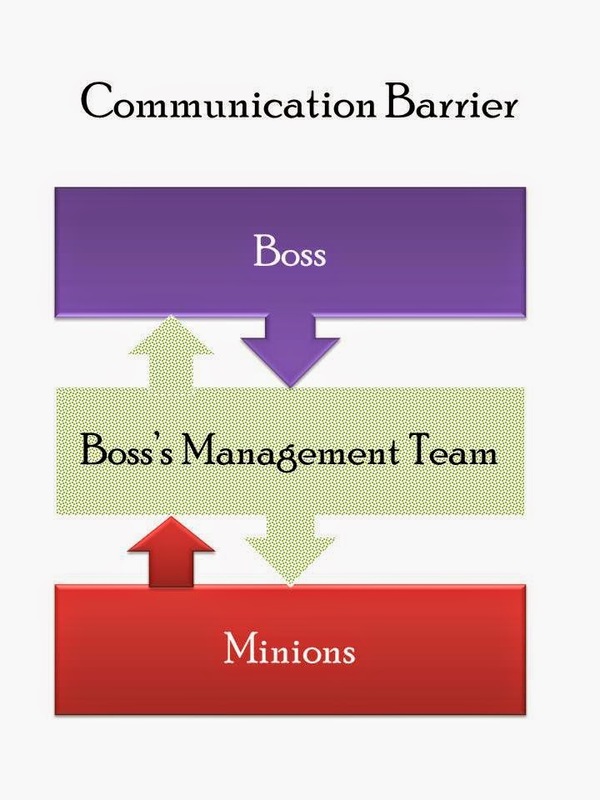 Hence, open and direct communication between the boss and the minions ultimately improves productivity. And makes everyone happy (or happier, or less unhappy) to come to work. “Congratulations and best wishes to Mary Teegarden on the birth of her second child, another girl, who weighed in at a whopping 12 pounds! Who knew a woman so small could have such a big baby!” Ok, I probably wouldn’t include the part about the big baby, but you see what I mean. “Kudos to Mary McClain who just finished her first marathon! “Kudos to Roberta Kobe for creating 1,000 handmade cards for Operation Write Home”. Communication should not only be in written form. Successful managers meet with their staff on a frequent and informal basis. For example, instead of eating at your desk or in the executive dining room every day, wander over to the cafeteria and sit with a random group of your employees. Do it often so the shock wears off. The boss at my former company came to our floor so rarely that when she did, you could almost hear Stanley Tucci shouting “Gird your loins, people.” Bosses should not have to arrive with advance warning. When people connect with each other on a personal level, they discover they have mutual itnerests, which helps build rapport. Also, it’s a lot easier to be snippy with someone you don’t know. If you know and like the people you work with, an atmosphere of collegiality will organically emerge. It’s not enough to call the department collegial at the quarterly all-department staff meetings. How would a boss know unless she actually spent some time in the department? Her staff probably told her the department was collegial. Which is what she wanted to hear, after all. It’s also important to provide opportunities for the employees to socialize with each other on an informal basis. The water cooler type of thing. Bring a box of donuts once in a while. Celebrate birthdays with the entire department, not just a small group of cubes. In one law department I worked in, the GC had his office on the same floor and did not have his own bathroom. He had to walk down the hall every so often. He would take that opportunity to say hello and ask people how they were doing. Again, we saw him so often that he wasn’t scary. I can hear the excuses now: Well, we are so spread out, and plus we are all so busy, especially me. Well, if a boss is going to focus on managing up instead of managing down, she won’t take the time to get to know her staff. If the staff is big and spread out, that’s all the more reason to focus on communication. People who care about each other tend to work well with each other. Collaboration creates positive morale. A negative environment builds walls. Managers seem to undervalue the importance of morale. As long as everyone is getting their work done, what difference does it make? Plenty. Let’s say one admin is working on a huge project for her boss. They are getting ready for a big meeting. She has to put brochures together, create notebooks, nametags, etc. She could do it by herself, but it would be faster and easier to do it with help. At the next cube, another admin is done with her work for the day. She can either surf the net, or offer to help her colleague. If the department is collegial and collaborative, she’s more likely to help. If morale is low, she’s more likely to say, screw it, what do I get out of it? Which leads me to the final link in the continuum– productivity. If morale is low, productivity is going to suffer. People will do their jobs and not one bit more. If they don’t feel appreciated, they are not going to go the extra mile. Why bother if no one notices or cares? On the other hand, in an environment with true collegiality and collaboration, everyone works together toward a common goal. It’s not rocket science, people. It’s just common sense. This entry was posted in Corporate Disfunction and tagged career, corporations by Renata Manzo Scruggs. Bookmark the permalink. Yep. Not sure why communication is so difficult for people, but I suspect FEAR is the root cause. You have heard the stories about my boss… He has been there for at least 7 years and I know he doesn’t know a thing about me, but he will go on and on about his family at staff meetings and spend hours talking about his favorite football team with the other men. Just as well, I don’t want him knowing anything about me anyway!